Material – wood, aluminum, steel, or fiberglass? Making a list and evaluating the options are, by themselves, a challenge, apart from the practical considerations, such as installation, security, and maintenance. While the size of your garage is the ultimate factor to consider in choosing your garage door size, other considerations, such as vehicle type and size, your lifestyle, and your home’s architectural design are equally important. 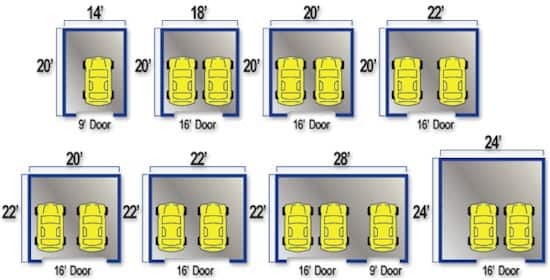 There are different garage door sizes for various types and sizes of vehicles. Standard garage door sizes of 8’x7’ (width x height), 9’x7’, or 10’x7’can house a single car. Sizes of 8’x8’, 9’x8’ and 10’x8’ are also available to choose from, to accommodate taller vehicles, such as SUVs and vans. For housing two cars, standard garage door sizes available are 12’x7’, 14’x7’, 16’x7’, and 18’x7’, as well as 12’x8’, 14’x8’, 16’x8’ and 18’x8’. Most manufacturers offer the same standard garage door sizes. However only a few have their ideas for particular models. Another key factor in garage door size selection is your lifestyle. Are you keeping one or two cars? If you have one car but plan to have two soon, then a double car standard garage door should be your choice. If you have a sedan and a second vehicle, such as a van, pick-up truck, or SUV, the size of your larger vehicle would be the primary consideration for choosing garage height. Size selection would also depend on your other planned uses for your garage. If you plan to use your garage as a workshop or laundry area additionally, then, definitely, a larger garage door size would be a must. Another consideration is your local building code. For example, hurricane wind load zones, such as particular areas in Florida and Texas, may not allow 18 ft.
Full garage doors. It is best to consult with your local manufacturer to guide your decision-making in this regard. It is best to consult with your local Garage Door Company to guide your decision-making in this regard. Last, but not the least, consideration in choosing your garage door size is overall look. Remember, your garage door is more than 40% of your home’s exterior, and is among other things that people see first in your house. If you have a narrow frontage, a double car garage door could take up most of your home’s front view. In this case, you can compensate the “look” with stylish and modern designs that create an illusion of width. Whatever your choice is, make sure that it complements your home’s architectural design and landscaping. What is my current need? What is my immediate plan? Does my choice fit with or complement my home design? The above questions also apply in evaluating options on garage door type, material, style, etc., and considering possible constraints, such as space or budget. If space is a constraint, the roll-up would be a better choice than the side hung the door. If budget is a constraint, then, undoubtedly, you cannot go for wood Garage doors or steel, which is more expensive than fiberglass or aluminum, nor can you go for brand names or commissioned designs, which would cost much more. Wood, though attractive and allows for more innovative designs, requires insulation and high maintenance, adding to the initial material cost. Security, however, is one of the things that you need to spend on. There is a wide variety of choices that could match your budget. Selections vary from the highly secure voice recognition or pattern identifier systems to the older, but less secure, thumb scanning system. Reading various garage door reviews should assist you in your garage door selection. These reviews offer advice and tips in choosing the right garage door for you, based on the first-hand experience. Look for reviews that provide objective views on pros and cons of various selections of garage door types, sizes, materials, colors, styles, accessories, and prices, as well as those that touch on issues such as garage door security, installation, maintenance, and problems. Beware, though, of reviews written by advertisers, as these would, of course, be biased towards their products.